There will be two of us for our pizza party tonight. Happily, we each love the clean and fragrant flavors of the Mediterranean. 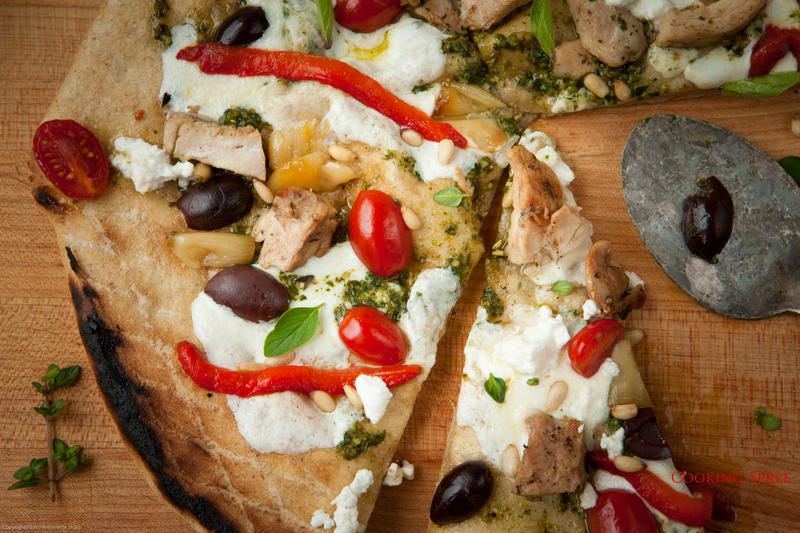 So, for us, what we’ll put on our grill-fired pizzas is easy. 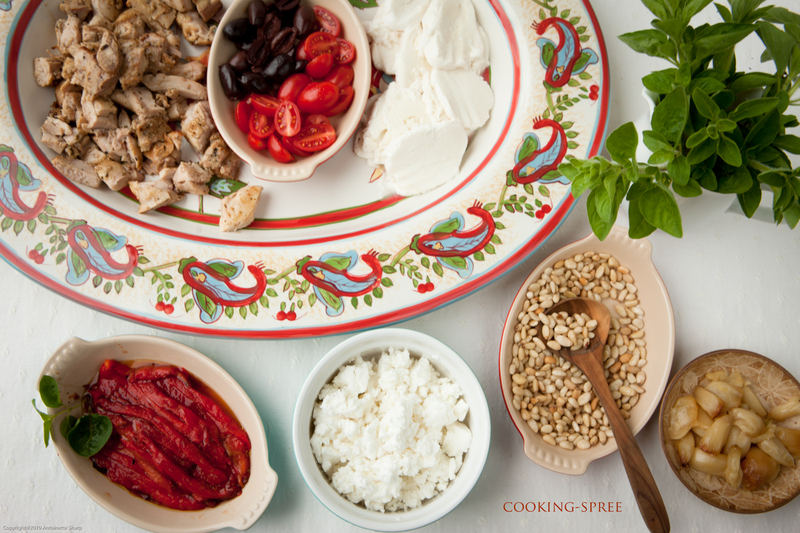 Tonight, Greeks and Italians join hands and toss a mess of really good things on our pies! Combine marinade ingredients in small bowl and put the chicken in to marinate for a couple of hours (if you have the time.) Turn occasionally. NOTE: When it comes time, you’ll be taking it out to the grill to bake on one side, then bringing it back to the preparation table to top with the good stuff – and returning to the grill to finish cooking. Cheese -grate or thinly slice the mozzarella. Crumble the feta – reserve the feta for when the pizza comes off the grill. Refrigerate both. 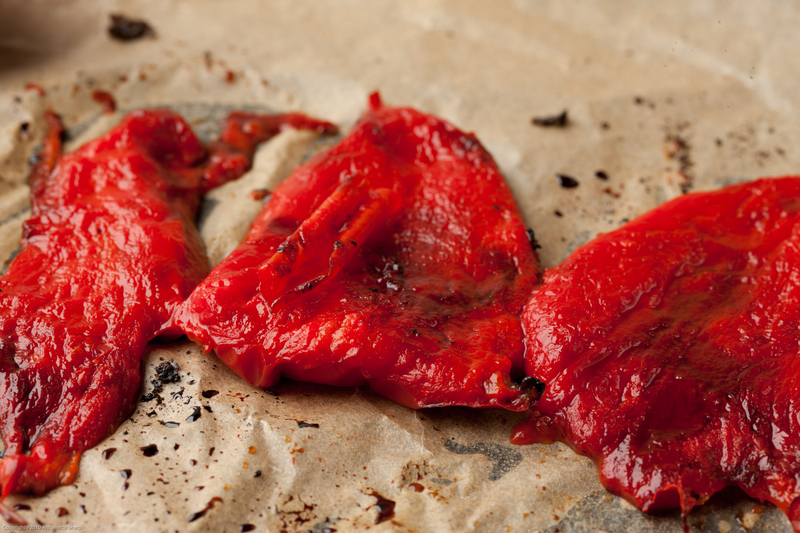 Roasted red pepper – Either buy them in a jar, or — Cut a red pepper in half from top to bottom, removing the seeds. Place cut-side down on a baking sheet (or in the toaster oven, along with your garlic). Roast until the skin blisters and bubbles and begins to blacken. (This would take about 35 minutes in a 450° oven.) Remove from the oven with tongs and drop into a brown paper bag. Close the bag up and allow the peppers to steam in there for maybe ten minutes or so. The skin will peel right off. 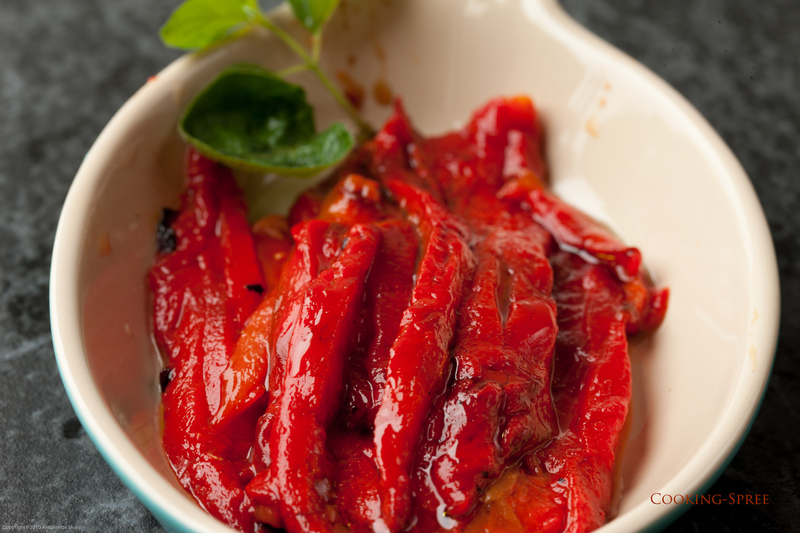 Slice the roasted peppers into long thin strips. Pine nuts – In the same oven or toaster oven, set temperature to 300° or so. Roast your pine nuts, tossing a time or two, and watching carefully because they will go from just right to burnt in a flash. Pesto – Either use a store-bought version or make your own. In a later post I’ll share my absolute favorite recipe for pesto. For other dishes where pesto is the star, you don’t want to mess around. But on this pizza, you’re just looking for the addition of some basil-y/garlicky goodness. So here’s a fast version: In the blender or food processor, blend 1 cup fresh basil leaves, 1 peeled clove garlic, 1/4 cup pine nuts, lightly toasted. Stir in 1/4 cup grated parmesan cheese, and then 1/2 cup extra-virgin olive oil (or a little more). Season with salt. If you use store-bought you might want to add extra olive oil to thin it out so that it’s more easily drizzled atop your pizza. Fresh herbs – Wash your herbs, cover and refrigerate. Simply tear them loosely on top of your finished pizza. Pizza Sauce – Optional – We won’t be using a red sauce tonight, but you might prefer that. I’d recommend getting a good quality jarred sauce for this purpose. Lots of other options – little tomatoes, halved, or sun-dried tomatoes, baby spinach leaves, Greek olives, and so much more. Shortly before pizzas are ready to be assembled, you’re ready to put the marinated chicken on the fired-up grill. (Drain most of the marinade from it first.) When it’s nicely done, cut it into bite size pieces and put in a serving dish. Lay out all the other pizza fixings, plus olive oil, salt and pepper. Roll out the pizza dough as described (in the dough step above). Take it to a hot grill (450° to 500°), oil the grate (if you can do so safely) and then quickly place the pizza round on. Watch for light toasty doneness. Remove and take it to the preparation table. Turn the cooked side up. Then, leaving a 1/2-inch border around the edges, brush on olive oil and/or pesto sauce, sprinkle salt and pepper, then spread mozzarella, roasted red pepper, chicken and roasted garlic. Return to the grill and, keeping the temperature a bit cooler for the 2nd side, cook until cheese begins to bubble and crust is toasty. Bring to the cutting board, scatter on crumbled feta, toasted pine nuts and fresh herbs. Slice and serve! Buon Appetito! You are so faithful and consistent in your comments (not to mention KIND – oops I just mentioned it). Thank you so much dear girl! I love you! Those visuals absolutely make me SQUIRM! I am so going to buy my dough and toast my own pine nuts and grill myself a pizza that looks just as fresh and snappy as the one in those photos! And I don’t have to worry that I gave my pizza stone away. Who needs it? What a fun party idea…you could cook the one side of some mini pizza doughs then let everyone build and grill their own.